Ears to Hear – St Catherine: Behave Like a Person in Love! St Catherine of Siena: Behave Like a Person in Love! The reading that follows is an excerpt from St Catherine of Siena to her confessor, a Dominican friar, Bartolomeo Dominici. It highlights some of her classic images: God as a deep, peaceful sea, and God’s love as a fire. 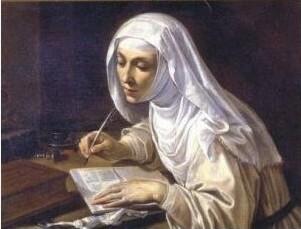 http://dominicans.ie/wp-content/uploads/2012/01/4_29_catherine_of_siena_writing.jpg 229 301 Luuk Dominiek Jansen OP http://dominicansinteractive.com/wp-content/uploads/2015/11/Crest-mod-300x300.png Luuk Dominiek Jansen OP2012-01-18 14:33:102014-03-05 18:54:00Ears to Hear - St Catherine: Behave Like a Person in Love!